Speaking with the Texas General Land Office on Wednesday, Texas Gov. Rick Perry addressed Texas' preparedness for the impending landfall of Hurricane Alex while finding time to take a shot at Washington. Alex spun off tornadoes and drove cautious families into shelters Wednesday as the storm reached Category 2 strength. "Alex is growing in strength and bearing down on Mexico and south Texas. But we are ready to handle this storm and its impact," Perry said. "The latest estimates indicate that Hurricane Alex will make landfall overnight, packing winds in excess of 80 mph, storm surge of 3 to 5 feet or more." Perry added that all departments are ready to respond and that he has mobilized the Texas military forces to assist with any rescues that may be necessary. Hear excerpts from Gov. 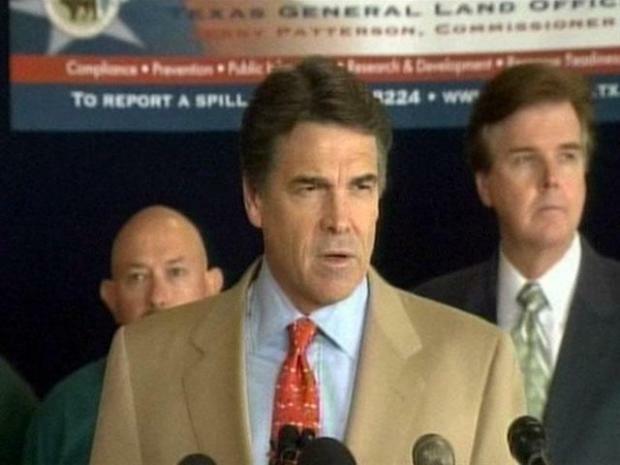 Rick Perry's address with the Texas GLO Wednesday on Hurricane Alex preps and the oil spill in the Gulf of Mexico. But as the hurricane churned deeper south of the Texas-Mexico border, some worries that the storm could hit Texas dead-on were eased. Cameron County Judge Carlos Cascos said Wednesday that Brownsville and surrounding areas had "dodged a potentially violent storm." But flooding was still a worry, with Alex expected to make landfall later Wednesday. Still, 9-foot waves were reported on the South Padre Island beach. Heavy sheets of rain from Alex's outer bands lashed Brownsville and South Padre Island, already soaking some areas with 4 inches of rain by Wednesday afternoon. At a shopping plaza at the foot of a bridge into Mexico, shop owners taped windows and swept water pooled on the sidewalk into the empty streets. 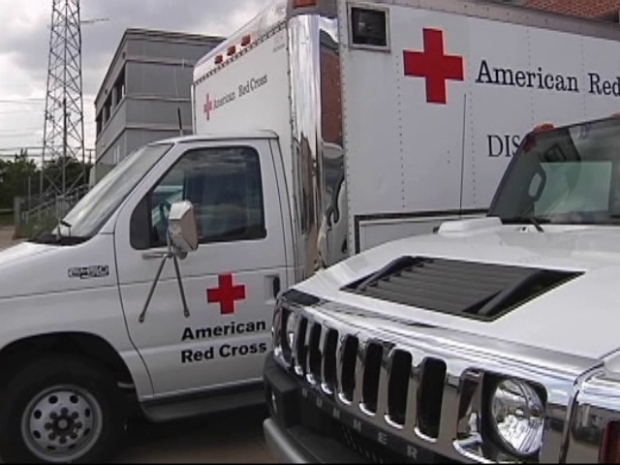 The American Red Cross and Texas Baptist Men head South in preparation for Alex which could hit the Texas Gulf Coast. Other stores, meanwhile, began removing plywood boards nailed up just days earlier as Alex shifted further south. But there was still danger. Alex spawned two tornadoes around Brownsville, including one that flipped over a trailer. No injuries were reported. A tornado watch remained in effect for Cameron, Brooks, Kenedy and Hidalgo counties until nightfall. Residents of South Padre Island are preparing for the worst as Tropical Storm Alex strengthens and moves closer to the Texas coast. On South Padre Island, officials closed the causeway from the mainland as winds kicked up and rain whipped the popular vacation getaway. The strongest winds near the center of the storm as of 6 p.m. were 100 mph sustained, topping the Category 2 threshold, according to the National Hurricane Center. The storm center was 80 miles south of Brownsville and moving west at 12 mph, but it still was expected to dump upward of 6 inches to a foot of rain in the area. Forecasters expected some parts to get up to 20 inches, comparing the potential to Hurricane Dolly in 2008. Perry said his greatest concern is flooding, but vowed the state is prepared for storms this summer as well as any impact from the Gulf oil spill. He said the GLO's has worked hard to prepare the Texas coastline for ramifications of an oil spill, much like the Deepwater Horizon spill that has plagued the coastlines of Louisiana, Mississippi, Alabama and Florida. "One thing is for sure, Texans can be confident that the General Land Office has helped prepare Texas. We're ready, should any residual effects of this tragic event reach our shores," said Perry. The governor also took a quick jab at President Barack Obama and his administration for their handling of the tragedy and praised Texas Sen. Kay Bailey Hutchison for moving to waive the Jones Act, a maritime law designed to protect U.S. shipping interests that is hampering efforts to get foreign aid boats into the gulf. "I share the frustration of my fellow governors over in those eastern states at the Obama administrations unwillingness to utilize every available resource to control the spread of that oil," said Perry. "Washington has prioritized bureaucracy and centralized control over approaches that could actually help. I support Sen. Hutchison's legislation to waive the Jones Act so that containment cleanup experts could take part in the effort. That's the right move, and it's well overdue." Get the latest news direct to your phone with NBC DFW SMS alerts. Text "DFWBreaking" to 622339 (NBCDFW) to subscribe to this free service. (Message and data rates may apply through your mobile carrier).